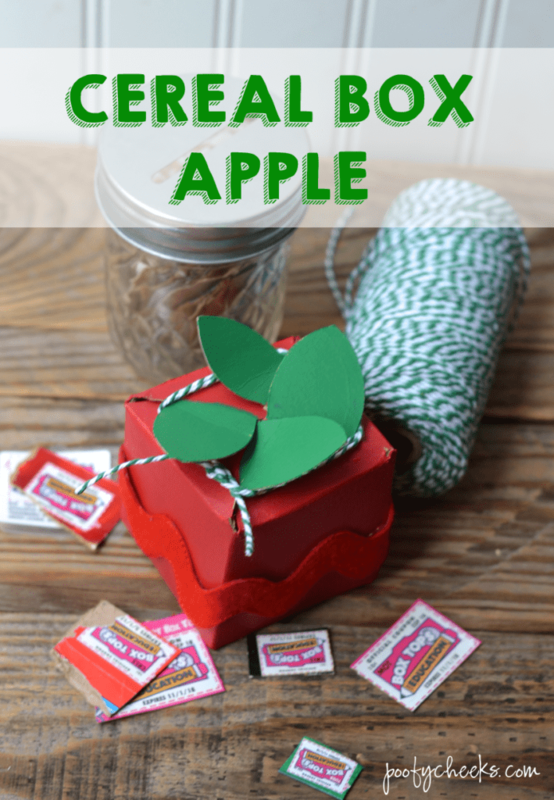 I have a fun kid (or adult) craft to share today using a cereal box. Over the summer my boys loved crafting and painting. There were a handful of times you could have come to our house to find our entire family of six all around the table painting, coloring or crafting. My husband would have the music on and I would be trying to craft but usually refilling paint or gluing something for the kids. I love to reuse as many things as I can and when we ran out of things for the kids to paint I resorted to empty cereal boxes. I experimented with a few boxes and designed an apple box since everything has seemed to revolve around going back to school. It is the perfect size for small treats or box tops. I may or may not have had a thought to use all of our cereal boxes for the next month to create my own mini apple orchard! I don’t cook breakfast during the week. We eat something quick like yogurt, cereal bars or cereal with milk. We have lots of boxes and overflow our recycling bins on a weekly basis. We cut the box tops and put them in our jar and then the two oldest boys have the daily chore of taking out the recycling. When the box top jar is full the boys split them up and take them to school. The box top jar is currently overflowing from all the ones we collected through summer. There are going to be two teachers receiving box top apple boxes this week! You can’t tell but I can barely push any more box tops into our jar! We were able to pick up two boxes of cereal and a box of cereal bars at Walmart last week that had Bonus Box Tops on select General Mills® items. Ready to make your apple box!? Step 1: Cut the template out using the printable and scissors or a silhouette and the cut file. I used my silhouette on the chipboard setting. Step 2: Once the box is cut out fold it using a scoring knife to make defined folds. Step 3: Use a hot glue gun to glue the box together. Step 4: Paint your box and then embellish if you would like. Fill it up and close the lid. I’m in love with the way the boxes turned out and the boys thought they were the coolest things! Mission accomplished – I kept them busy for an afternoon using an old cereal box. Cost to me = FREE + we ate the cereal + we saved the box tops for education to send into the school. Fist pumps in the air like I just don’t care! Have you done any crafting with reused or recycled items lately! ?